Repairing or replacing electronics, appliances and major home systems can run into the thousands of dollars. Mercury’s Home Systems Protection provides coverage for these items when home systems break down or need to be replaced. Smart homes, from energy-saving thermostats to electronic smart locks, are part of a growing technology trend that continues to evolve and shape consumers’ lives at home. These systems can bring added security and comforts, but are also expensive to purchase and repair. Mercury Insurance (NYSE: MCY) offers Home Systems Protection, a coverage option designed to help homeowners pay for unexpected repair and replacement costs for kitchen and laundry appliances, heating and cooling systems, home entertainment equipment, home security systems, smart home systems and more due to electrical or mechanical breakdown. Chairlifts, elevators and mobile medical equipment. Physical damage. Pays for the cost of repairing or replacing home systems damaged by a home system breakdown. Spoilage. Pays for replacing food that spoils as the result of a home system breakdown along with any necessary expenses incurred to reduce the amount of spoilage. Loss of Use. Pays for the cost of a hotel stay or the temporary relocation of tenants necessitated by a home system breakdown. Expediting Expenses. Pays for the cost of emergency service calls and temporary repairs to home systems which have suffered a home system breakdown. Environmental Improvements. Pays an extra 50% of the covered loss toward replacement of equipment with a type which is more efficient or better for the environment. This condition only applies if the damaged equipment cannot be repaired and must be replaced. 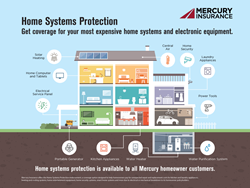 Visit https://www.mercuryinsurance.com/insurance-products/homeowners-systems-protection.html to learn more about Mercury’s Home Systems Protection. Mercury Insurance (MCY) is a multiple-line insurance organization predominantly offering personal automobile, homeowners and commercial insurance through a network of independent agents in Arizona, California, Florida, Georgia, Illinois, Nevada, New Jersey, New York, Oklahoma, Texas and Virginia. Since 1962, Mercury has specialized in offering quality insurance at affordable prices. For more information, visit http://www.mercuryinsurance.com or Facebook and follow the company on Twitter.